A good place to start is also where most visitors start planning their trip: Santorini. 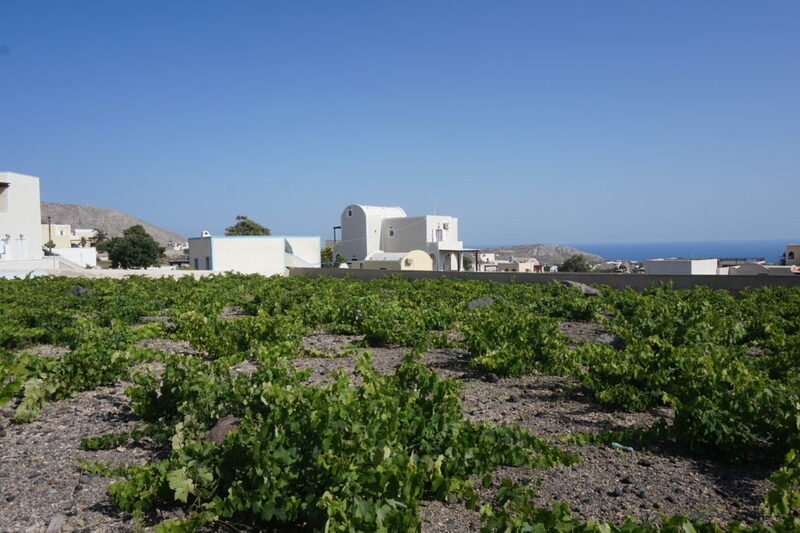 Santorini is one of 25 Protected Designation of Origin areas where it has been identified that exceptional wines are made from indigenous varieties. The combination of terroir and the indigenous grape varities produces some unbelievably unique wine. The island of Santorini in the Aegean has very unique growing conditions. Intense heat from the Mediterranean sun. The winds blow at such great speeds that they shred leaves and berries from the vines. The extreme winds are countered by training vines into a basket shape, in concentric circles close to the ground. This method protects grapes from the wind and provides further shade from a dense canopy of leaves. Now that the grapes are protected from the worst effects of strong winds, the wind influence helps to temper the intense heat. The major benefactor of this unique growing environment is Assyrtiko. This white grape is by far the most planted on the island. Wines made from Assyrtiko are typically high acid, high alcohol and full-bodied white wines. They are really unique and very different to Riesling, Chardonnay, or any other international white varieties. They have fresh citrus and mineral aromas and generally stun visitors to the island as perfect accompaniments for the traditional cusine. Not to be confused with the vin santo of Italy, this sweet wine is made by drying out Assyrtiko grapes and then pressing the raisin-like grapes to produce a thick, syrupy juice. They are fermented to a low level and usually barrel aged, producing a beautifully balanced sweet wine that goes perfectly with strong cheeses. 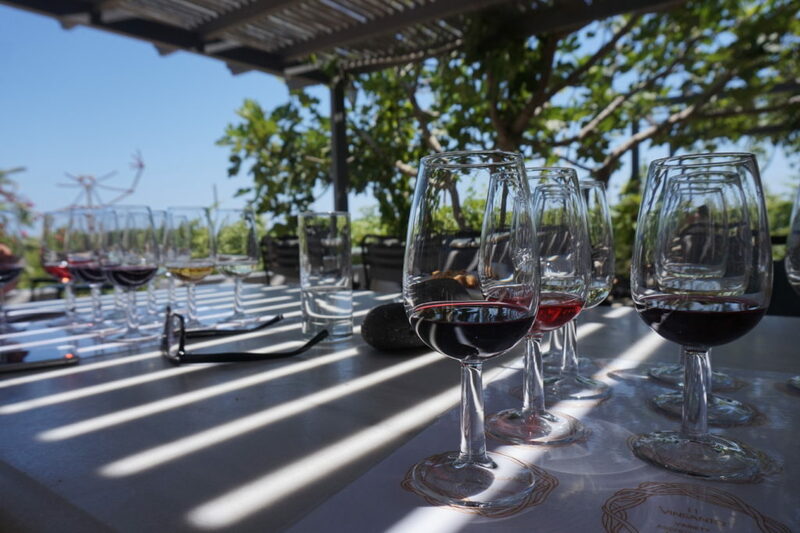 There are great wines made all throughout Greece, from Crete to the Mainland and all around the islands. Here are a few more white varieties and styles that are good to know. 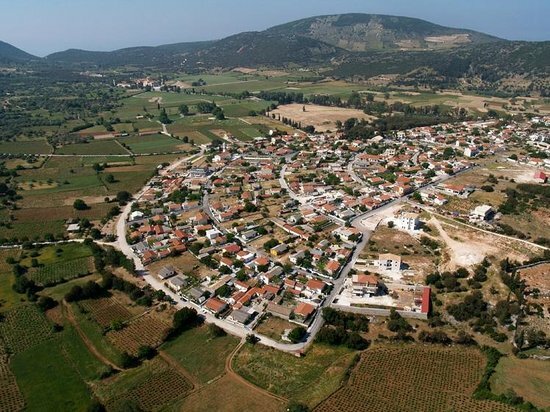 Robola is a less well known grape than Assyrtiko but is recognised as producing some of the better white wines in Greece. It is being planted quite widely, but the best examples come from the hills of Cephalonia, where they are grown in the traditional untrained bush vine style. The best Robola wines are elegant with crisp citrus flavours and look a lot more like continental whites like Chablis or dry German Riesling than other Mediterranean styles. 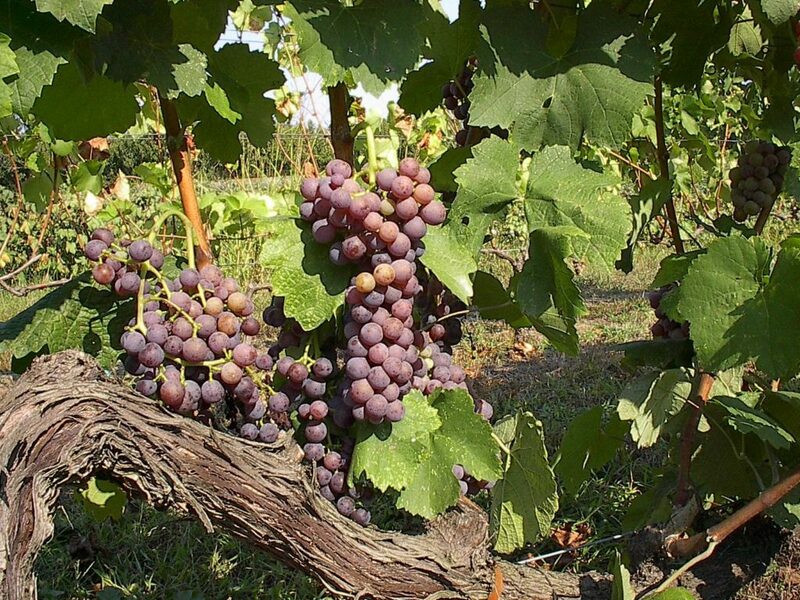 Moschofilero is a pink-skinned grape that offers great floral aromas and is a little reminiscent of Gewurztraminer, although lighter-bodied and not so oily. There is a lot of potential with Moschofilero and related fileri grapes, including rosé style and late-harvest, botrytised wines. Retsina is an ancient style of white wine flavoured with tree resin, which grew in popularity in the twentieth century. The strongly aromatic wines are great served chilled but can be a bit polarising. A lot of producers jumped on its popularity but not all were great quality, and sales declined along with a mixed reputation. Today you can find really well made and high quality Retsina that offers the distinct Pine flavour. You can find out more about Greek wine and taste the above styles and more at Melbourne’s new Greek wine and food festival Oinofilia which starts this Saturday 24th of June. Read more about Greek reds and sweet wines in Part Two of our introduction.